Generally speaking, yes, but practically, it’s not very likely. When you’re connected via wi-fi, at least. It is VERY hard (nearly impossible for an average person) to determine if your wireless provider has assigned you an IP address when you’re using a data connection, and even harder to determine what it is, so it’s less likely anyone is able to track your location when you’re just using your regular data plan. That said, virtually every time you connect to a new wi-fi network, it will assign your device a common IP address that is usually randomly chosen by the access point or router broadcasting the signal, so that variable also makes it virtually impossible for someone to guess which IP address you have been assigned. In addition to that, wi-fi routers act as a hardware firewall for your devices. They typically randomly assign you only a “local” IP address and then route the outbound traffic to a modem, which is the only device on the network which has a unique, traceable, and geo-specific IP address. This IP address will never be identified by your device or revealed to your device, however, so it is very unlikely anybody could track your device that way either. Because the router is in place when you start receiving data, the data is transmitted wirelessly to the common randomly-assigned IP address for your device on that network, which, in a sense, anonymizes your device. 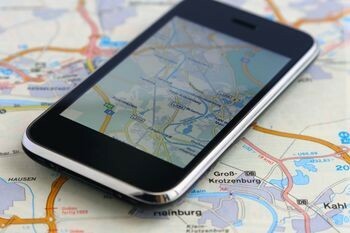 So, while it is possible someone can geo-locate you by knowing your phone’s IP address (which changes every time you leave your house and come back, as well as every time your device finds a new network to connect to), it is incredibly unlikely due to the nature of cellular data networks and wi-fi routers. If you want to be extra careful when sending or receiving data, the best practice is to avoid wi-fi networks and rely only on your data plan coverage, also disable any active Bluetooth connections. A phone with Bluetooth turned on is surprisingly simple to hijack and intercept data from up to a few hundred feet away, but that is also a severe limitation, you have to be within range to intercept and at that point, there’s no need to track your location. If you want a simple, easy, and unbelievably effective way to protect your IP address from unwanted trackers and prying eyes, try out a reliable, anonymous VPN service. Our affiliate PrivateInternetAccess has the best speed and most reliable servers of all of the ones we've used. Not only does it only cost as much as a cup of coffee per month, but you can also pay for your subscription with your gift card to that same coffee place ;) (Or bitcoin, or pre-paid credit card, etc.) Click the banner below to get started! Are you worried about mobile security? Leave us a comment below about it.